A group of women kite surfers has set a new record off the Cornish coast. The three top women kite surfers became the first to complete a 70-mile route from the Isles of Scilly to Watergate Bay in north Cornwall. Seven of them originally set off from the Scillies on Thursday afternoon, 28 miles west of Land's End, but four had to retire. The trip took just over six-and-a-half hours longer than expected because of a period of light wind. 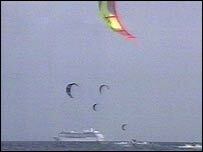 The kite surfers are going apply to have their trip recognised by the Guinness Book of Records. First ashore was 32-year-old world number nine Andreya Wharry, from Mawgan Porth, north Cornwall. Behind her came world number one Cindy Mosey, from New Zealand, and world number 10 Claire Bunton, from Surrey. Andreya, who had previously only sailed eight kilometres, said: "It's a real shame we didn't all get back together. "It went very well, but it was trickier than we expected with a bit of funny wind direction at the end. I think we did around 80 miles in all." The event aimed to raise over £10,000 for the Royal National Lifeboat Institution and the Silke Gorldt Foundation, which educates children in safe kite surfing.